Yep, it's the BIG one! 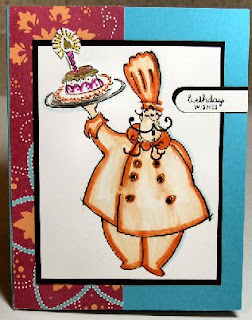 And celebrating with me this week is the FAMOUS...FOODIE CHEF! Foodie Chef is all decked out in orange today, and you can find out why here. This card is done using the Technostamper Challenge #8, a great layout that I know I will use over and over again. 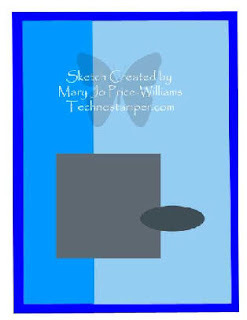 Great card for MJ's sketch challenge! You say it's your birthday....It's my birthday too...Off to check out your foodie blog! Happy Birthday to you!! Love the chef I have that set too. Orange is an interesting color to try. HAPPY BIRTHDAY to my BGF!! Cute card! I don't use my chef stamp near enough!!! I love tastefully simple's beer bread....yummmmm...........! What a fun card. Happy Birthday to you my friend. Thanks so much for playing.